I had a very important meeting earlier this week which I can’t disclose but it took me to an office that had lots of lovely books that I was allowed to choose from to take home with me. I could have taken a few but I decided I didn’t want to look greedy (and I would have needed a van) so I just selected one. And by one I mean The One. I’m 99.9999% sure this book is going to be my favourite book of the year. 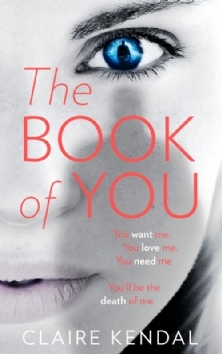 The Book of You by Claire Kendal is out next week and it’s going to be a hit–I can say that with the utmost certainty. I flicked through the first few pages after my meeting and had to find somewhere to sit and dive in… it was that good. I whipped thought the 300+ page book in a matter of hours, unstoppable in my page turning. It’s miles better and more exciting than Gone Girl and Before I go to Sleep combined. I seriously LOVED this book. It’s out next week from HarperCollins–check out my review on Judging Covers! This week’s brilliant twitter meme #BeyonceBooks. Buzzfeed have kindly done a roundup of some of the best including my personal favourites Put a Lord of the Ring on It and Run the World in 80 Days. Check out Buzzfeed’s list here and let the laughs commence. YOU. Yes you, you crazy, weird and wonderful people. You with your weird search terms… a few weeks ago it was “trees that smell like tacos.” Yesterday I had TWO in one day! Not only did I get “sensual massages in fairdale and louisville ky” but also “why are there so many fat people in oxford street.” I mean… who the heck is googling this stuff? But even more importantly, what have I been writing about on my blog?????? Tell me in the comments what you’re all about this week! Next ›Do you need a mentor?